Once you know how to hit a hybrid club and the right times to use one, lower scores will be within your reach, something every golfer welcomes! If you want to make an easy improvement to your golf game, investing in a hybrid iron is a good way to do it. For those of you who have never heard of the hybrid iron, the club is essentially engineered to be a combination of a long iron and a fairway wood. Traditionally, the hybrid iron will be of similar length and distance to the long iron, but it will also be a lot more forgiving, and able to get your ball into the air quickly like a fairway wood. Today we will be going over some of the basics of the hybrid iron so that you can start lowering your scores! So without further ado, let’s take a look at how to hit a hybrid club, starting with when to use hybrids. One of the best things about the hybrid iron is that it is perhaps the most versatile club in the game. You can use it from the tee, the fairway, the rough, the fairway bunker, and even for chip shots around the green. We will now break down a few of the situations where you might benefit from using a hybrid. No one loves to sideline their driver but sometimes it is necessary. If you really need to hit the fairway and just haven’t been getting much luck with the big dog, busting out a hybrid iron is a great way to enjoy a combination of distance and accuracy that other clubs simply cannot match. While the hybrid typically takes the place of a long iron in terms of distance, I have actually generally found that it hits more like a fairway wood off the tee, meaning you can still expect to enjoy a lengthy tee shot even when you play it safe. The fairway is probably (hopefully) where you will be using your hybrid club the most. From this position on the course, you really are just going to use your hybrid the same way that you would have used the long iron it is replacing. For example, if you find yourself 215 yards out (a distance you would ordinarily use your three iron for) you would instead use your three hybrid. Generally, it seems that hybrids go a little bit farther than their long iron equivalents (perhaps because they are much more forgiving) so you will need to experiment a little bit with your ideal yardages in order to make sure that you are putting the ball as close to the hole as possible. No one ever wants to be in the fairway bunker. It is perhaps one of the most feared shots in golf, but the good news is that with a decent lie and the right club this dreaded shot is all bark and no bite. You definitely will not always be able to use the hybrid iron out of the bunker. In order to use this club from this position, you are going to require a few factors working in your favor. First, you need to make sure that the lip of the bunker is low enough to be cleared by the trajectory of your hybrid iron. While hybrids do have a reputation for getting up in the air quickly, at the end of the day they are still a low lofted club which means that they may struggle to clear high lipped bunkers. You are also going to need to make sure that you have a good lie. If you’re buried, or otherwise encumbered by an unfortunate position, take your medicine and chop out with a short iron. Finally, you are also going to want the sand to be tightly packed so that the turf almost resembles the consistency of the fairway. While you can technically hit this shot with a fluffy lie, it will mean that you need to hit the ball perfectly in order to get it anywhere at all. A nice, tightly packed lie will give you a little bit of much desired forgiveness. One last thing to consider about hitting the hybrid from the bunker is distance. Keep in mind that if you have a good lie and a good position your shot is probably going to travel roughly as far as it would from the fairway, so be confident and aim for the flag! Hitting from the rough is about the same as hitting it from the fairway. Treat this shot like any other long iron shot: if you are at a distance where you would normally hit your three or four iron, it is time instead to bust out the hybrid. The only thing to keep in mind is that, while hybrids do handle deep rough much better than fairway woods do, they might struggle a bit if your ball is completely buried. This is sort of a novelty shot, but it is also very consistent and reliable if you practice it. 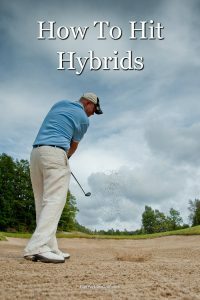 In order to use your hybrid to “chip” the ball you are going to need a perfect, unobstructed lie on the fringe of the green. Keep in mind that the ball is never really going to pop in the air in this instance, so you will want to make sure that you have a clear line to the green. Once you have deemed that you are in a situation that warrants a hybrid chip, simply use a motion similar to that of a putt. Be careful though! The spring like face of the hybrid club will get your ball rolling quickly. The good news is that you already know how to hit a hybrid club! The swing mechanics are the same as that of a long iron meaning there really isn’t much of a learning curve at all when you put this club in the bag. To refresh your memory, you are going to want to set up to the ball with your feet parallel, spread shoulder length apart. The ball will be played up closer to your leading foot, and then you will simply swing away! The goal here is to hit down on the ball the way you would with an iron (not sweep it as you would with a wood). The good news is that you won’t really need to think much about that move as the length and design of this club is such that it naturally promotes that type of downswing. To hit the hybrid off the tee you are going to do roughly the same thing that you would to hit it off the fairway. There are two small differences. The first is that you are going to play the ball slightly more forward in your stance so that it is just inside your leading foot. The second (naturally) is that you are going to be using a tee to perform this shot. To properly tee the ball for a hybrid shot you are going to want to plant the tee deeply in the ground so that the ball shows just slightly over the top edge of the club at address. And that’s it! Swing away and find the fairway! In conclusion, you really are going to want to give this club a chance. The hybrid is easy to hit, it’s long and it is very forgiving. What else could you want out of a golf club? Add a hybrid to your back today to enjoy longer tee shots, and closer approaches.